Primroses (Primula spp.) erupt into bloom early in the growing season, making them one of the first perennials to herald the spring each year. Their cheery, five-petaled flowers and lush greenery add long-lasting color to lightly shaded beds where few other plants will thrive. However, primroses must be planted under suitable conditions and provided with the right care to ensure their long-term prosperity. Primrose flowers range in color from creamy white to deep red. Hardiness varies among primrose species, although most are tolerant of cold conditions. Common varieties such as the hybrid primrose (Primula x polyantha) and Japanese primrose (Primula japonica) perform best within U.S. Department of Agriculture plant hardiness zones 3 to 8, while more heat-sensitive species such as the drumstick primrose (Primula denticulata) grow best in USDA plant hardiness zones 4 to 7. Primroses require cool weather and consistently moist soil to truly prosper in a garden setting. Most varieties grow best in part shade with bright light but no direct sun exposure. However, the drumstick primrose needs full sun to bloom well and will perform best in cool-summer climates where extreme heat is rare. All primroses enjoy moist soil, but most will not tolerate a waterlogged environment. Exceptions are Japanese primroses and drumstick primroses, which will thrive in soggier areas where other varieties may fail. A well-drained and weed-free bed is vital for primroses. Weed and till the bed twice in the weeks before planting to prepare the soil. Work a 2- to 3-inch-thick layer of pine bark humus into the top 6 to 8 inches of soil if it is sandy or clay-based. Don't replace more than half the soil by volume with the amendment because it may damage the plants. If the soil is poor, sprinkle 10-10-10 ratio fertilizer onto the bed at a rate of 1 pound per 100 square feet of area to provide a boost of nutrients after planting. Spring is the best time to plant primroses, particularly in areas with harsh or long, cold winters. However, they can also be planted in autumn in mild winter areas. Spacing varies by species and is determined by their mature spread. Hybrids can be planted 8 to 12 inches apart while Japanese and drumstick primroses range from 9 to 18 inches apart. When planting, loosen the roots and make sure the plant's crown -- which is the base of the stems -- is at the same level as it was in the original nursery pot. 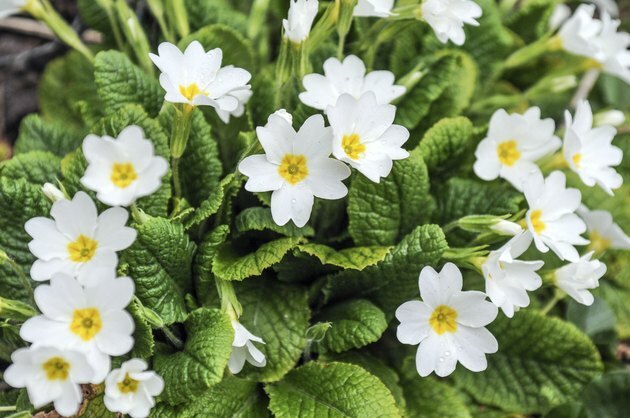 Primroses require relatively little hands-on care, although they benefit from routine maintenance. Keep the soil moderately moist in the top 2 to 3 inches, but let it dry out slightly on the surface between waterings to prevent rot. A 2-inch layer of mulch will help keep the roots moist and cool in summer and sheltered in winter, but it must be changed yearly to remove any pathogens or insects. Feed primroses annually each spring with 10-10-10 ratio fertilizer applied at a rate of 1 pound per 100 square feet of area. Do it after removing the previous year's mulch, and work it into the soil surface to keep it from washing away. Good cultural practices prevent most serious issues in primroses. However, they may develop bacterial or fungal infections under cramped, wet conditions. Symptoms such as yellowing, stunting, wilting and dieback indicate an issue such as aster yellows, botrytis or root rot. Infected plants should be discarded to prevent the spread of disease. Pests such as spider mites and slugs occasionally plague primroses. Although seldom damaging, they are a nuisance and can be removed manually with a strong stream of water or by hand.